You know you want to start a business and give yourself the best shot at success, but perhaps you’re still considering the kind of business you want to pursue. After all, you probably have a number of small-business ideas. One thing is for certain: the type of business you start should be well-suited for your expertise and business goals. Successful entrepreneurs bring their varied experiences and skills and allow these assets to inform their business decisions. So, assess your priorities and lifestyle and business goals. Perhaps you’re looking for a retail part-time business that’s entirely online and has to do with the growing pet industry. Or you have a home-business idea of setting up an online gluten-free catering business out of your kitchen. Figuring your industry, scale and funding will automatically narrow down your options. Let’s explore three common types of businesses to get you started. Ecommerce is an online business idea that would allow you to sell goods and services either on your own website domain or within an online retail marketplace like Etsy or eBay. Oftentimes, with ecommerce businesses, there’s room for flexibility and a lower threshold for entry. Business can be conducted part-time and remotely, depending on your business model. 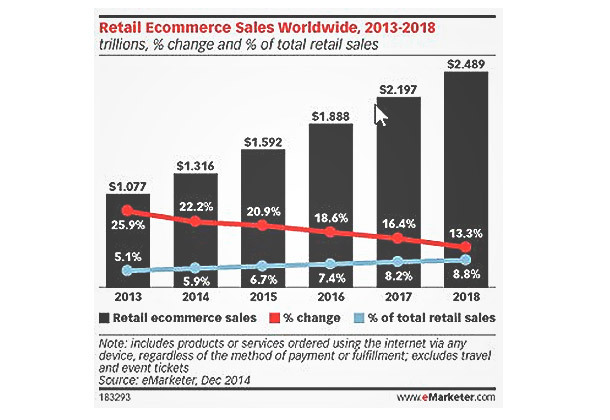 Online retail is a growing global market, accounting for $1.3 trillion in sales worldwide in 2014, according to a report from eMarketer. That figure is estimated to reach nearly $1.6 trillion in 2015. Let’s say you’ve already figured out there is a viable market for the products or services you want to sell. You’re going to need a website. Good retail websites rely on three basics: Clear images of your inventory, descriptive text explaining the inventory and an easy payment funnel. Setting up a retail website that sell products is largely a DIY job these days. Adam Callinan, founder and CEO of BottleKeeper, an online retail company that sells individual bottle coolers, didn’t have a coding or web development background, but he created a website himself using WordPress and various ecommerce plug-ins. He also relied on the advice of those who’d been there, done that. “One of the things I did in hindsight that worked really well is that I had talked to other people that had already done it,” he says. Ecommerce platforms, such as Shopify and Squarespace, are both one-stop shops that allow you to select a design template for your storefront, upload photos of your inventory and add descriptions. Both platforms have payment funnels and will host your store for a monthly fee. On the other hand, creating a website that sells services, such as tutoring or access to a database that allows you to search jobs, requires a different business model and web development than an inventory-driven business. Services require explanation. So, from the get-go, make it clear to the visitor what your service provides, whether it’s illustrated in the company name, using an emblem/image on the website or having the service stated front-and-center on the website’s homepage. 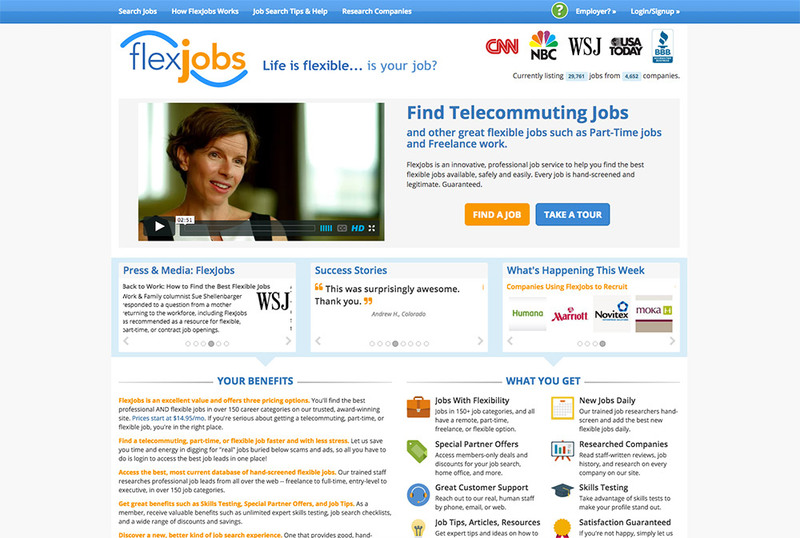 For example, the name of this flexible telecommuting jobs business is FlexJobs — which alludes to the service the business offers. Also, at the top of its website’s homepage, it clearly states: “Find telecommuting jobs and other great flexible jobs such as part-time jobs and freelance work.” You know what you will get with FlexJobs. Whether your services-based business model lends itself to an off-the-shelf ecommerce platform — or whether you will have to hire a developer to build your platform — will become obvious as you plan. To guide you, look to those websites already doing what you want to do in the same industry, and look for ones that provide positive user experiences. Who are your target customers? Where can you find them online? Is it immediately clear on your website what you’re offering? If you’re selling dog sweaters, is it obvious from the top of your homepage? How will you position and display your products/services on the website so that visitors can find the products/services easily? Will the customer be overwhelmed by the quantity of products offered on your website? How will customers purchase what you are selling? What are the payment funnels? What can you do to make it easier for the customer to buy something off your website? What are your plans for customer service? If you’re using e-commerce software (or a platform), is it scalable and secure? Does it have a set of conversation and marketing tools? The famous Field of Dreams quote “If you build it, they will come” doesn’t apply to ecommerce businesses — or any business, for that matter. But if you build your site with some strategy that’s targeted toward your audience and keep tweaking your product and website according to feedback and performance, your efforts are in the right direction. Becoming the owner of a franchise, or “franchisee,” requires purchasing a license to use a franchisor’s name, logo and business processes as well as sell its products and services. The upfront franchise costs greatly varies depending on the initial franchise fee, marketing fees, training fees, retail build-out (if it’s a brick-and-mortar franchise) and royalty payments. One of the main draws of franchising is that it’s based on a system of duplicable business processes with a proven track record. Josh Brown, a franchise consultant and lawyer, recommends gauging your personal and professional experiences, your expectations and cash in hand — and see whether these are aligned with owning a franchise in an industry of interest. Brand name recognition: Franchises come with a degree of recognition and familiarity, however this does depends on your geographical region and whether the franchise has been introduced to the area you’re thinking about doing business. Reduced risk: You are buying into a system that has been proven to work, however there is still risk involved and the upfront cost can be significant, putting the franchisee in financial difficulty. “This is why I recommend that all franchisees have six to nine months of working capital available before buying a franchise,” says Brown. Built-in operations: Good franchise systems are organized and part of what you are purchasing with your initial fee and other payments is an organized business with a systemized plan to help you operate the business. You will be told exactly how to set up your location, how to operate, how to market, where to market and you will be provided with assistance along the way. Economies of scale: If you are part of a large system, and depending on the type of franchise, you can get better pricing on your end user products as part of a franchise system. However, franchises aren’t a fit for everyone. A franchisee must abide by basic systems and rules set by the franchisor, so you need to examine whether you’re the right fit. If you’re a fiercely independent person and hate interference, this business model likely won’t jive. The products and services and operations of your business will be dictated by corporate. Before considering a franchise, do your due diligence. Examine the Franchise Disclosure Agreement (FDD), which spells everything out on paper, including the responsibilities of the franchisor, the responsibilities of the franchisee and any litigation involving the company. It’s also important to go beyond the FDD; Libava highly recommends talking to 10 to 15 franchisees who own the franchise you’re interested in — and visit at least two in person. Also, if you’re not understanding the various FDDs, consider hiring a franchise lawyer to break it down for you. While it may cost you several thousand dollars to hire a lawyer, it will save you the heartache of going forward without understanding what you’re signing yourself up for and creating problems down the road. 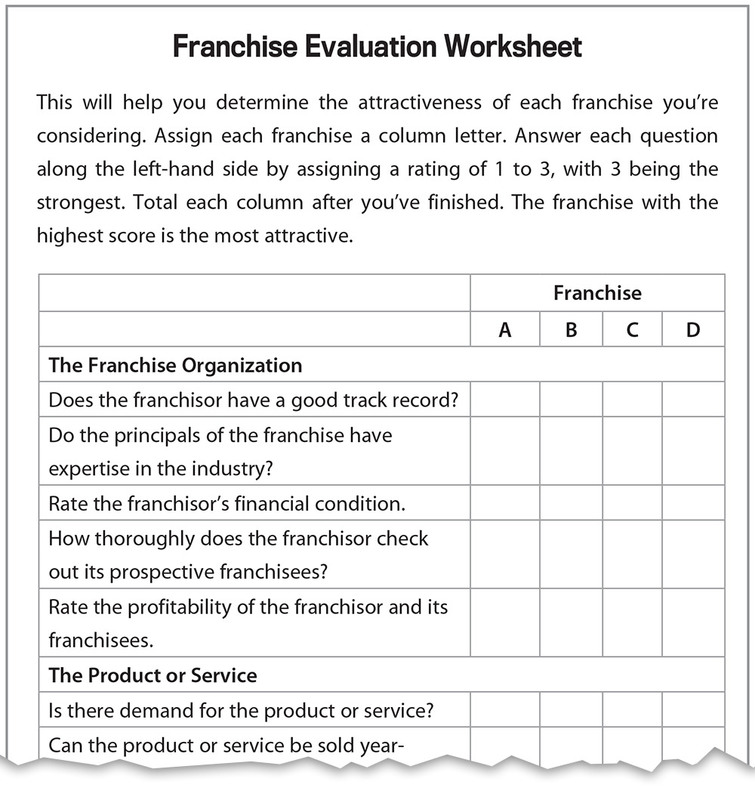 Use this checklist from Franchise Evaluation worksheet from Start Your Own Business, Sixth Edition (Entrepreneur) to assess the viability of whatever franchise you’re considering. Like with investing in a franchise, buying an existing business comes with the advantage of not having to reinvent the wheel. “With an existing business, it is not just guesswork – there is historical data, ongoing customers, employees in place, the necessary equipment and inventory (where applicable) to operate the business,” says Richard Parker, author of How To Buy A Good Business At A Great Price and founder of Diomo, a web resource for those looking to buy a business. Another advantage for buying an existing business is it’s often easier to get financing and the failure rate is lower. While statistics vary, approximately 50 percent of businesses fail within their first five years, reveals a 2014 Gallup study. “A business that’s been around for more than five years has already hurdled the startup failure rate,” says Parker, who has owned 13 businesses, including several startups. Speaking from his experience with startups, Parker says that the revenue generally takes twice as long to generate than originally projected and expenses are always more than anticipated. So, what’s not to like about buying an existing business? Well, buying one is typically more expensive than building from scratch. What’s been built into the deal — inventory, policies and work methods — may be obsolete or part of the reason why the business is being sold off. Also, watch out for legal liabilities and/or liens that come with the business. 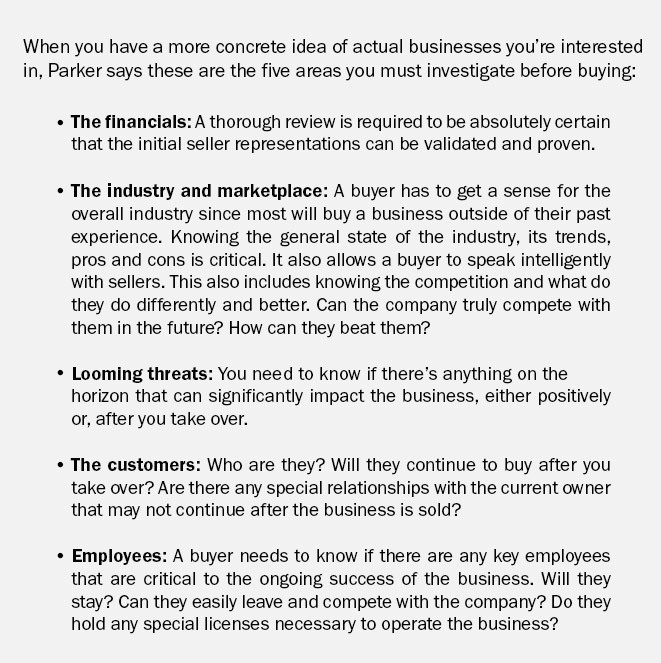 While the seller is supposed to disclose liabilities contingent and otherwise — it’s also possible that the seller isn’t aware of some himself. This is where a competent attorney is handy, to do a thorough lien search and make sure the seller is selling the assets free and clear. Of course, as with going into any business, select a business in an industry you are familiar with and understand. What is the size of business do you want to manage? How many employees and locations? Once you’ve figured out the industry, scale and location, investigate businesses in that area that meets your needs. And don’t assume that because a business isn’t listed for sale, that the owner isn’t open to offers. If you’re a newbie to the business buying scene, hire a lawyer who will limit your liability and risk and an accountant who will do the financial due diligence and provide tax-related guidance. There’s an element of risk to every business venture. That’s part of the draw. The end goal isn’t to avoid risk but to reduce the risk and make informed decisions. 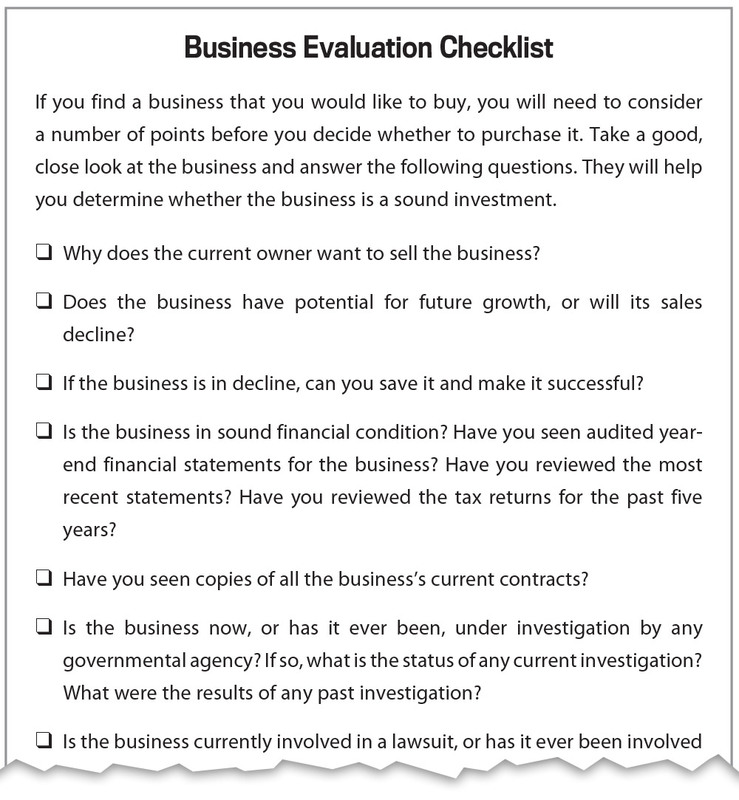 For a comprehensive checklist of things you should consider when looking to buy an existing business, use the Business Evaluation Checklist from Start Your Own Business, Sixth Edition.